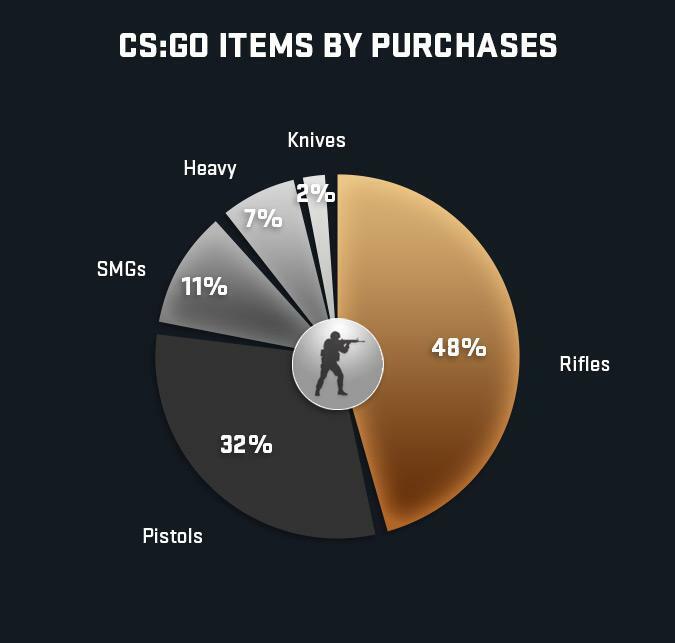 Okay, if you were trying to guess what CSGO items are the most popular and the most required among gamers, we here to help you with the answers! This article will surely provide you with information on the best CSGO skins, including the best CSGO weapons and the best gun in CSGO. Don’t worry, we base our answers on real data taken from the analytic tools of DMarket. DMarket is CSGO, Dota2 and other games’ items trading marketplace. You can check the CSGO skin trends chart in their blog. So it’s not just vague assumptions: we build our judgment on real users’ demand. 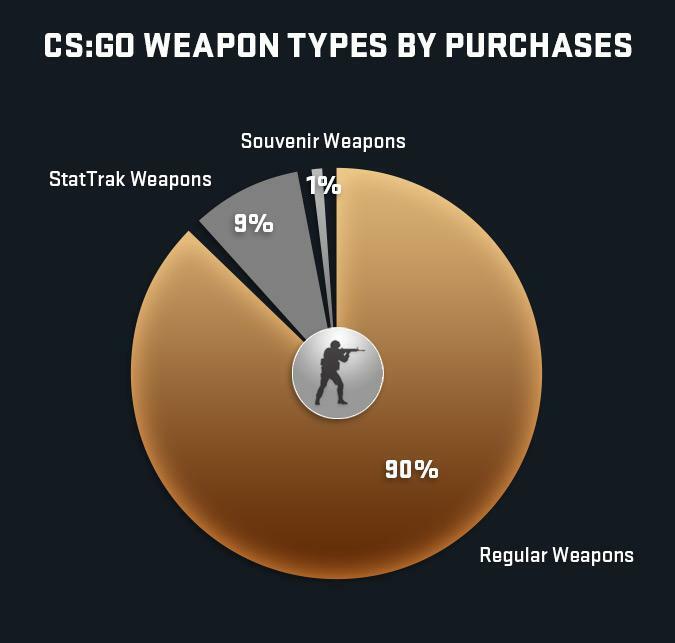 Since the platform has gathered many CS GO players under its umbrella, we can access such data and transform it into a piece of useful information. 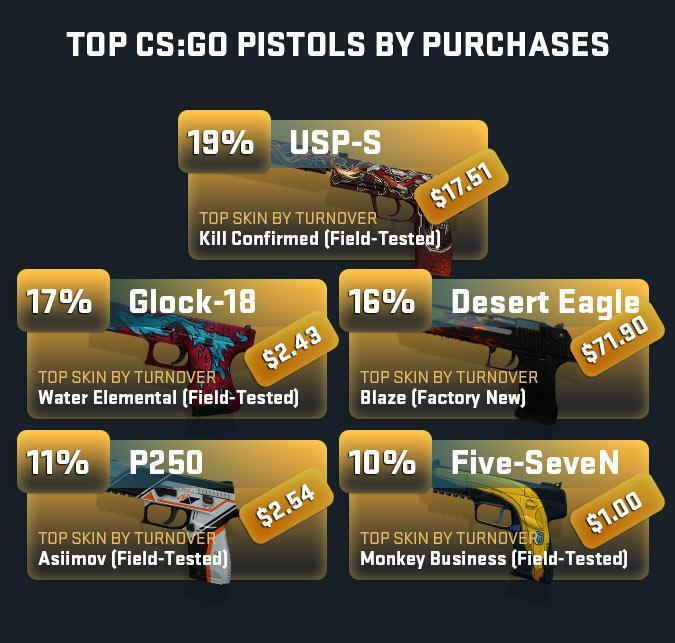 Whether it’s the most popular CS:GO pistol, or the highest-grossing skin for AK-47, or even an average market price for all CSGO best skins… we have it all. Let’s dive into numbers and discover what skins were super hot sellers. Seems like weapon skins are taking over! 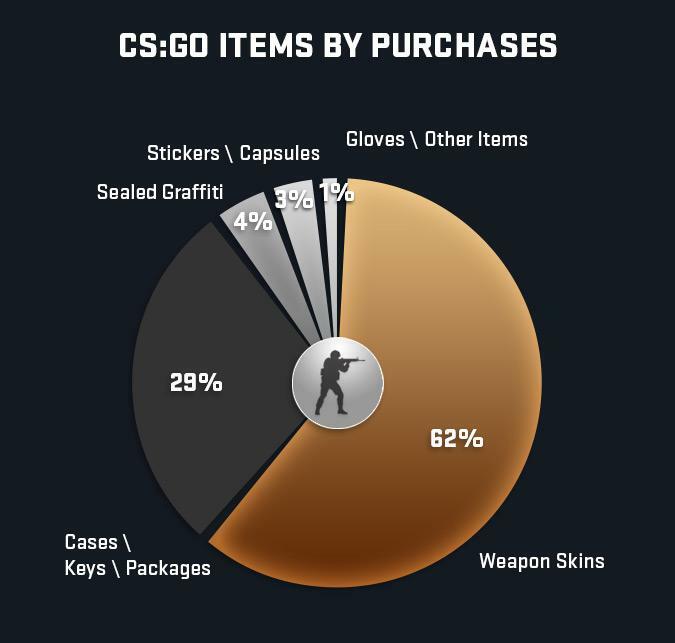 In 2018, they made more than a half of all CSGO skins deals in the market. 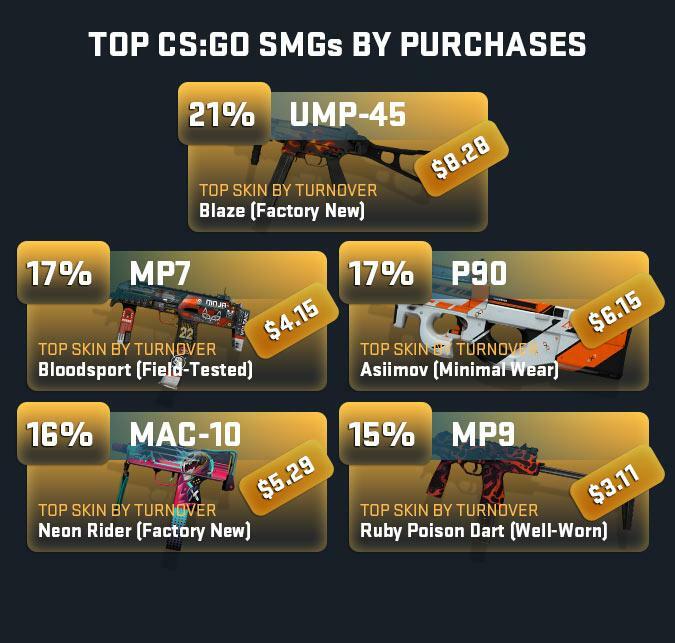 At the same time, demand for CSGO cases, keys, and packages were considerably lower, and therefore these skin types landed on the second position of our chart. As you can see, almost ten hundredths (9%) of these purchased skins had StatTrak kill counters. At the same time, only one-hundredth of rare and therefore expensive souvenir skins made the list. Well, obviously it’s just not a thing for a wholesale. So, due to whatever reason rifles and pistols are the most needed items among the CSGO gaming community. Maybe, the main reason is the price? That’s why Knife skins are not so widely popular among traders. But a cool knife can really make you a proud owner of a skin that is always with you. So it’s something in the middle. Gamers do not need well-worn skins, but factory new is not the “must” for them either. It’s all about expenses versus quality. 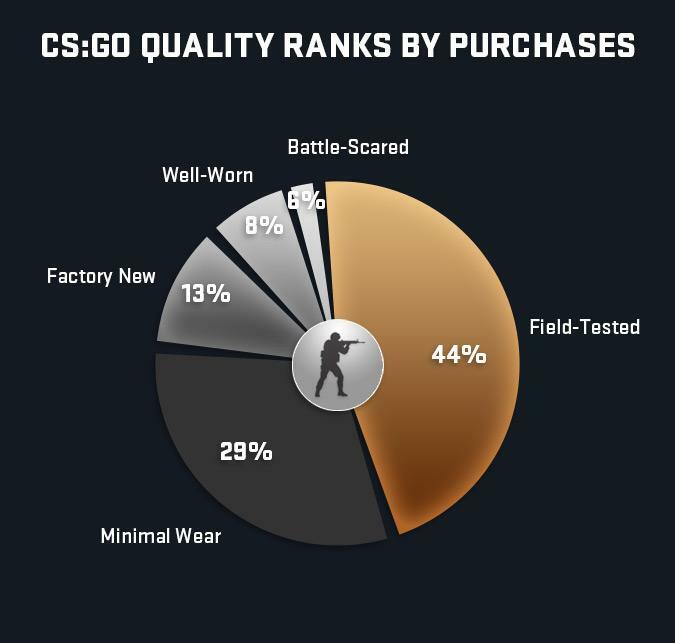 CSGO players do not want to spend much money on factory new, at the same time they are not into worn stuff. And that’s why Field-tested skins are the most popular! Let’s go deeper and find out interesting statistical facts regarding best gun in CSGO. to be more specific — let’s discover rifle skins that are most wanted by the gamers. Below you can access a table comparing average prices and demand of these rifles. 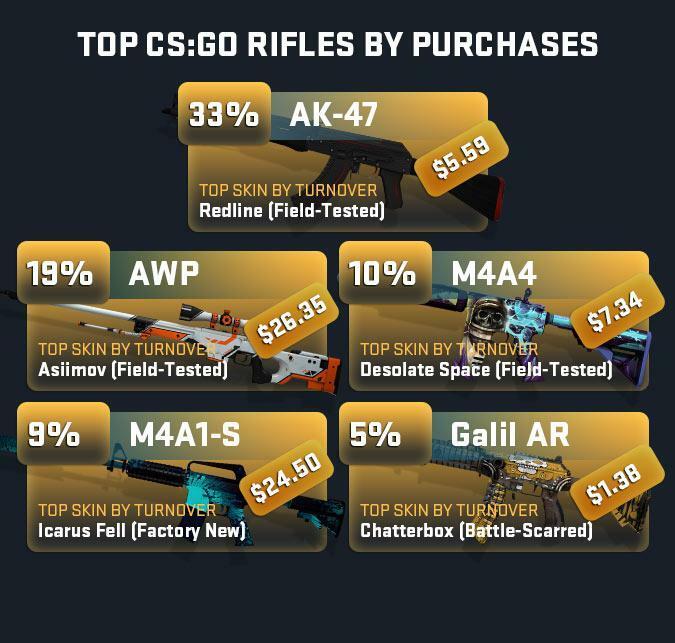 Oh, it comes as no surprise: AK-47 is still the most popular rifle and the most popular skin overall. Field-Tested Redline is the most loved skin, and it’s easy to guess why. Just check that wide spraying and powerful gun! Moreover, Redline’s average purchase price was $5.59 in 2018. Now let’s proceed to the AWP. AWP is left far behind, but still, it comes as the second popular rifle skin in market. And even more, this item has no competitors among sniper rifles! Right after AWP comes M4A4, M4A1-S, and Galil AR respectively. Comparing to the situation with rifles, here we have quite a different case. We have the first, the second, and the third places with USP-S, Glock-18, and Desert Eagle respectively. Looks like these guys a staying really, really close to each other. It’s not an easy competition, isn’t it? Congrats to USP-S having 2% gap and taking over the first place! And now it’s time to check the popularity of SMGs. What’s the most popular SMG item? You will find out if check the comparison table and visual below! Here we have quite the same competition as with pistols. UMP-45 is slightly ahead. At the same time, MP7, P90, MAC-10, and MP9 follow UMP-45, staying pretty close to it. How’s it going with heavy rifle skins? Who is on the top, and who is dragging behind? Our visual chart and table compare heavy rifles demand, structuring them by the number of purchases, while also showing their medium price. Okay, here we have Nova on top of the chart! Nova’s Field-Tested Hyper Beast is the top-demanded skin with average $2.23 price in the secondary market. When it comes to knives, CSGO gamers obviously love The Factory New Doppler skin. It’s the top knife skin by turnover in 2018. 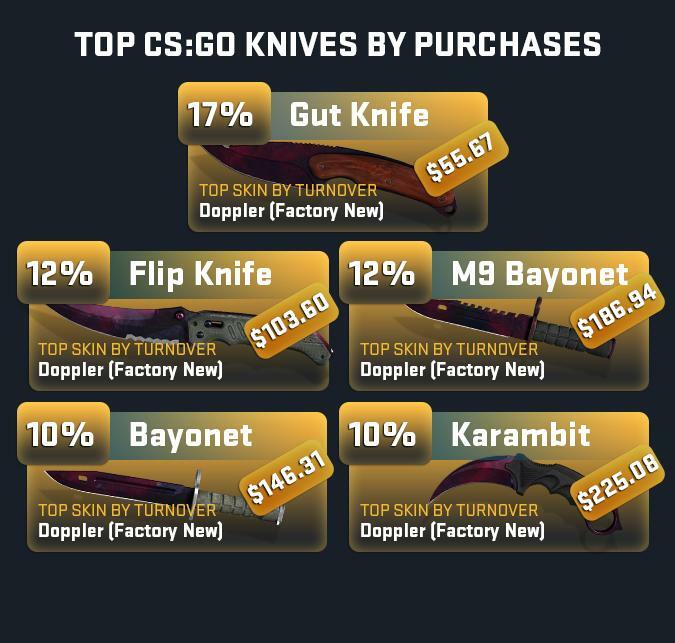 Players are ready to spend money on expensive knives, and especially nice ones! Hope it was a useful read for CSGO fans who want to understand skin popularity trends. Take your time, compare all the prices, and if you’re ready to sell or buy — do it consciously. If you do consciously, you can either break or lead trends. And also always have fun while playing CSGO, it’s the most important point of this article!